"Thank you so much for updating my tired looking website. I'm really pleased with your speed and the professional way you have gone about this. Within an hour of you updating my content I've had two enquiries, one is for a large job and maybe a contract. Thank you so much again. I would definitely advise any one to use you and your business." 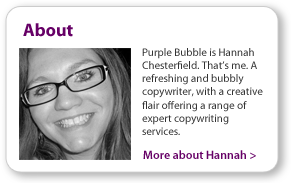 "I would just like to say how impressed I am with Hannah’s SEO copywriting skills. I needed my website re-writing as writing is not my strong point. I only have to provide Hannah with very basic information such as keywords I wanted to use, then I just sat back and let her work her magic. After Hannah emailed me my new web content for my homepage I was BLOWN away! The words just rolled off my tongue, and it was very easy to read with no start – stop (as with my writing). 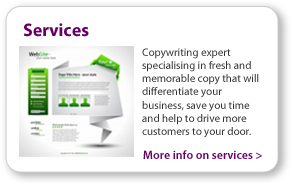 Hannah has definitely proved to me that she has a natural talent for this line of work and I will certainly be using her copy writing services again. Great copy = more sales!" " Hannah provided some great feedback for us on our wording, layout and general design of our web site. We found her very easy to work with, full of ideas, enthusiastic and hard working. We would recommend her." "When I decided that my website was going to be the face of my craft business, and in the first instance, my calling card to potential customers, I contacted Hannah Chesterfield of Purple Bubble Writing. Hannah’s quality of work and attention to detail displayed throughout the re-writing of my website, Wood Craft Creations, was extremely impressive. Her ability to create a professional and uniquely beautifully designed website from a bunch of text and photos I had displayed was especially impressive. I feel extremely fortunate to have found Hannah, and also am confident that my website will now give me a distinct advantage over other artists and craft designers. I look forward to maintaining a positive and productive relationship in the future as my business grows. Needless to say, I can highly recommend Hannah Chesterfield of Purple Bubble Writing."